Reliably quantitate protein with one of AMRESCO’s newest proteomics products, the BCS Assay. Obtaining quality protein samples and quantifying them are essential first steps in proteomics-based research. Proteins may be isolated from any number of tissue or cell types, each likely to require individually optimized extraction methods and buffers that contain various chemicals, including salts and detergents. The varied buffer compositions influence selection of a protein quantitation method, as most common methods are negatively affected by specific salts or detergents. AMRESCO’s new BCS Assay offers an excellent alternative that is compatible with the most commonly used chemical components that may interfere with conventional protein quantitation kits. AMRESCO’s BCS Assay is a kit designed for reliable and sensitive spectrophotometric quantitation of proteins in the presence of a wide array of chemicals. 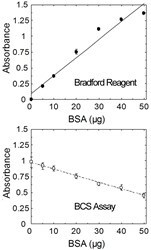 The BCS Assay exhibits low protein to protein variability because it utilizes amino acid-independent chemistry, an advantage over other methods reliant on specific side chains, such as the widely used Bradford assay. AMRESCO’s BCS Assay introduces Copper (II) to samples, where it interacts with the polypeptide backbone of any protein present. The remaining free Copper (II) is then reduced to Copper (I), which associates with a colorimetric dye and induces a color change. Protein concentration is determined by measuring the absorbance of the dye-Copper (I) complex, with the signal inversely proportional to the concentration of peptide bonds. Accurate protein quantitation, essential for subsequent sample preparation for downstream applications, must be reliable, sensitive and reproducible in order to generate meaningful experiments and data. The new BCS Assay, which is fast and easy to use, meets these requirements and is an exceptional choice for routine protein quantitation. Utilizing the BCS Assay allows for minimal sample manipulation, low variability between assay response for different proteins, and it is scalable for varied sample sizes. For more information about the BCS Assay or any other AMRESCO products, visit http://www.amresco-inc.com or call 1-800-448-4442.